As Seen on TV – Shake Shack: Yea, I ate that. And I saw Jeff Goldblum (but not at Shake Shack). On a recent business trip to New York, I had the privilege of finally trying Shake Shack, and I can say it definitely made the five-plus hour flight worth it! Because I was there for business, the entire trip was a lot of work and not a lot of play, so I didn’t actually manage to make it to the Shake Shack location itself, but I do have a nice group of colleagues who brought an order back from the original location in Madison Square Park for me on their lunch break. I have often heard that the lines at Shake Shack are quite daunting, and that this can be a bit of a downer, but it can also enhance the anticipation. Unfortunately, as didn’t get to make the actual trip to the stand, I can say that I was waiting with a lot of anticipation back at the office. Although it was February in New York, it was a pretty warm day in the mid-sixties, but still cool enough where the meal made it back slightly less than hot. Although that is normally a bit of a bummer, the fries and burgers will still awesome! 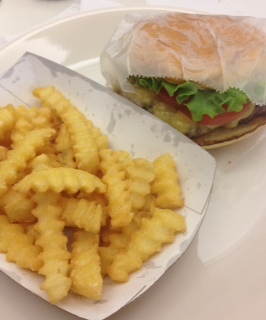 I was instructed by knowledgeable workmates that I should order the ShackBurger , and I’m glad I did. Featuring Shack Sauce, American cheese, lettuce and tomato, it was the perfect amount of greasy, and I mean that in the best way. Some people may shy away from grease, but when you are eating a hamburger, sometimes you need the real deal. And it wasn’t overly greasy, just enough to make it extra-delicious and seep slightly through the wrapper so you know you are getting close to something magical. Shake Shack is another spot that is embracing the crinkle cut fry, and that is the fastest way into my french fry-loving heart. The fries also have an awesome seasoning that goes a little beyond salt, but not quite into the realm of something overpowering and obvious. I ate my entire order and skimmed a few off the top of each of my colleagues’ orders. Next time I’m in NYC (hopefully sooner rather than later), I’m definitely making Shake Shack a part of my itinerary. Definitely one of my favorite NYC burger locations so far. Although not specifically related to Shake Shack, I did see Jeff Goldblum hailing a cab on my way to a post-work function, and that really sealed the day as going down in history as a good one. Was it Jeff Goldblum, the Shake Shack meal, or the open bar at the event later that night that made the entire day especially awesome? No one can say for sure, but it was a mighty trio.